New research from the Temple University School of Podiatric Medicine in Philadelphia, PA, raises questions about the clinical utility of assessing cuboid height to determine risk of midfoot ulcer development in patients with Charcot neuroarthropathy. Although previous research has suggested that a short cuboid height is associated with wound development in this patient population, the current study found no significant associations between cuboid height and the presence of midfoot ulcers. 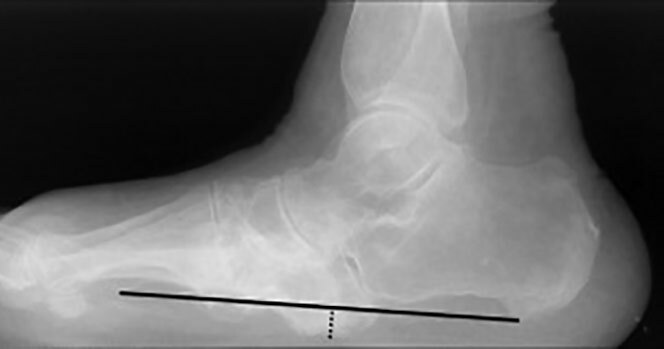 “Although we still continue to utilize the cuboid angle measurement in our clinical practice and consider it an important part of the radiographic evaluation of midfoot Charcot neuroarthropathy, it does not appear to predict the presence or absence of an ‘ulceration imminent’ foot,” said Andrew J. Meyr, DPM, FACFAS, an associate professor in the university’s Department of Podiatric Surgery and lead author of the study. The retrospective study, which was published in the July-August issue of the Journal of Foot & Ankle Surgery, included 60 patients (26 women) with radiographic evidence of Charcot neuro­arthropathy (Sanders classification type 2 or 3). On anterior-posterior radiographs, cuboid height was measured as the perpendicular distance from the most inferior aspect of the cuboid to a line connecting the plantar aspect of calcaneal tuberosity and the plantar aspect of the ﬁfth metatarsal head. Cuboid height did not differ significantly between the 28 patients with a history of plantar midfoot ulceration and those without. Similarly, in the midfoot ulcer group, the percentage of patients with a positive cuboid height did not differ significantly from the percentage of patients with a negative cuboid height. Ulceration also was not significantly associated with 11 other radiographic angular measurements in the foot and ankle. The Temple findings contrast with those of a 2014 study from the University of Pittsburgh that analyzed 114 patients with Charcot neuroarthropathy and reported a decreased cuboid height in 80% of the 50 patients with foot ulcers. Meyr said those findings were the inspiration for his group’s investigation. The Temple findings, Meyr said, suggest that a single radiographic parameter is unlikely to be predictive of plantar midfoot ulceration in patients with Charcot neuroarthropathy. This is clinically important, he said, because of the urgency clinicians feel regarding early ulcer diagnosis and intervention in this population. “Many physicians have a tendency to be more aggressive to treat or prevent wounds because wounds are clearly a precipitating factor to infection and amputation,” Meyr said. David R. Sinacore, PT, PhD, a professor in the Department of Physical Therapy and director of the Applied Kinesiology Laboratory at the Washington University School of Medicine in St. Louis, MO, concurred. Although the Temple study did not follow patients prospectively to see if those with more plantar flexed cuboid bones would be more likely to develop midfoot ulcers in the future, Meyr said it would be interesting to see if this radiographic measure changes over time, or stays consistent after the Charcot deformity consolidates. The Temple authors hypothesized that ulceration development may be more dependent on dynamic factors than static ones. Meyr AJ, Sebag JA. Relationship of cuboid height to plantar ulceration and other radiographic parameters in midfoot charcot neuroarthropathy. J Foot Ankle Surg 2017;56(4):748-755. Wukich DK, Raspovic KM, Hobizal KB, Rosario B. Radiographic analysis of diabetic midfoot charcot neuroarthropathy with and without midfoot ulceration. Foot Ankle Int 2014;35(11):1108-1115.